Dimensions 0.75 by 6 by 8.25 in. A guide to mastering the art of making bread contains both simple and complex recipes, all prepared by the renowned late chef. Reprint. 15,000 first printing. Amazon.com description: Product Description: The bestselling, classic book on baking bread, from the âDean of American Gastronomyââfeaturing his 100 favorite recipes and variations. From Buttermilk White Bread to Whole-Meal Bread with Potatoes, and from Challah to Crumpets, Beard brings together recipes from across America and around the world. Including a 12-point list of remedies for improving oneâs loaf, and a wonderful variety of different types of bread to bakeâplain, whole-meal, and sweetened breads, batter breads, baking powder and soda breads, rolls, flat breads, filled breads, fried breads, and moreâthis is the only book the home baker needs in order to master the art of making bread. 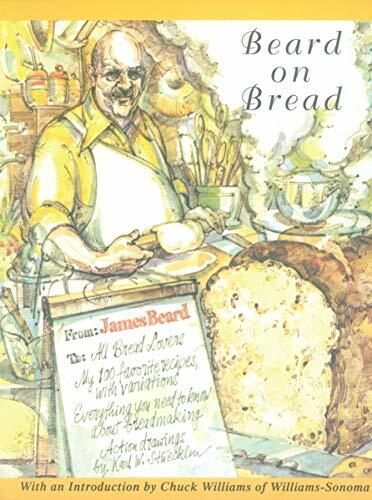 About: For everyone who wants to make wonderful, hearty, delicious breads of all kinds, turn to the bread expert, James Beard.